While the outside on H Street is somewhat foreboding, the inside has a friendly feel. The inside of the restaurant is fairly dark, but mirrors all along the wall and the open kitchen give the inside bar and dining area character. The upstairs section was not open during brunch. Unfortunately for the middle of the summer, there does not seem to be any air conditioning, and the restaurant becomes quite warm despite several fans. While recently far too hot to eat outside, the patio looks quite pleasant for an evening dinner or brunch in the fall. 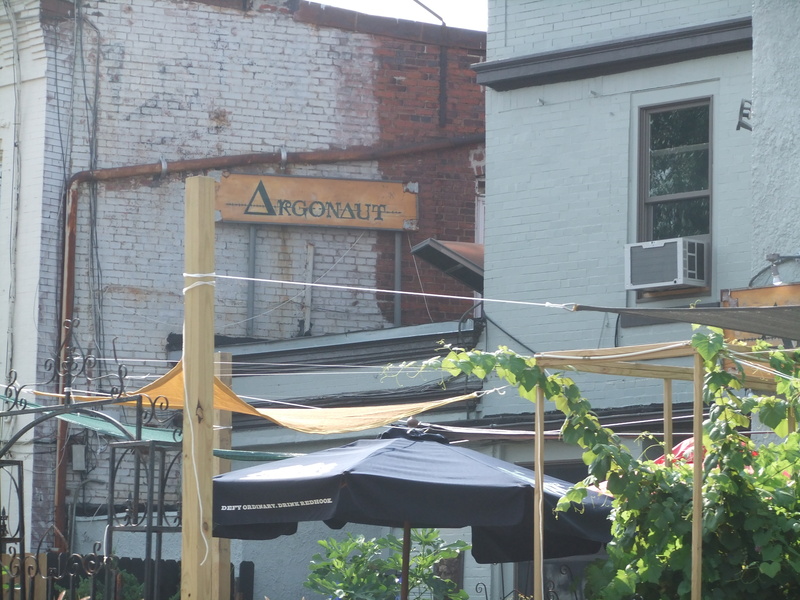 The Argonaut offers some of the best drink deals on the DC brunch scene. Make sure you ask your server about brunch drinks; our server did not mention them for some reason, but the other servers were telling all of their tables. $9 buys you bottomless mimosas that are actually unlimited (certain places will advertise “bottomless” but really do not mean it). Curiously enough, $7 buys you a single mimosa–clearly not a good value relatively. Additionally, for $5 you can build your own Bloody Mary. Your sever will provide you with a glass of ice and vodka and then direct you to a table where you can add your own ingredients and make it as spicy or mild as you want. If you don’t feel like a brunch beverage, The Argonaut has an entire book (literally a bound book they give you) of beer, wine, and other cocktails. A single mimosa can cost close to $9 elsewhere on H Street and around DC; The Argonaut offers the best value around for brunch beverages. The brunch menu is fairly limited but has fairly standard brunch items on it. On the breakfast side, the “h street breakfast platter” allows diners to choose their type of eggs, breakfast meat, and side item (either grits or homefries); diners can also build their own Eggs Benedict with a choice of smoked salmon, ham, or spinach. On the lunch side, The Argonaut offers a basic salad that can have chicken, shrimp, or steak added to it as well as a burger and tacos. An Eggs Benedict meal featuring smoked salmon and sides of bacon and homefries unfortunately disappointed. The Eggs Benedict themselves were well done with a decent hollandaise sauce and yokes that were not overcooked (often what kills Eggs Benedict) as well as a nice rosemary herb seasoning on top. However, the bacon was not fresh and had been continuing to cook under the heat lamp (one problem with an open kitchen is that diners can see what is actually going on). The cook was very generous with the quantity of homefries but way too generous with the salt as well. Overall brunch dishes seemed to have great quantity, but the quality could use some improvement. 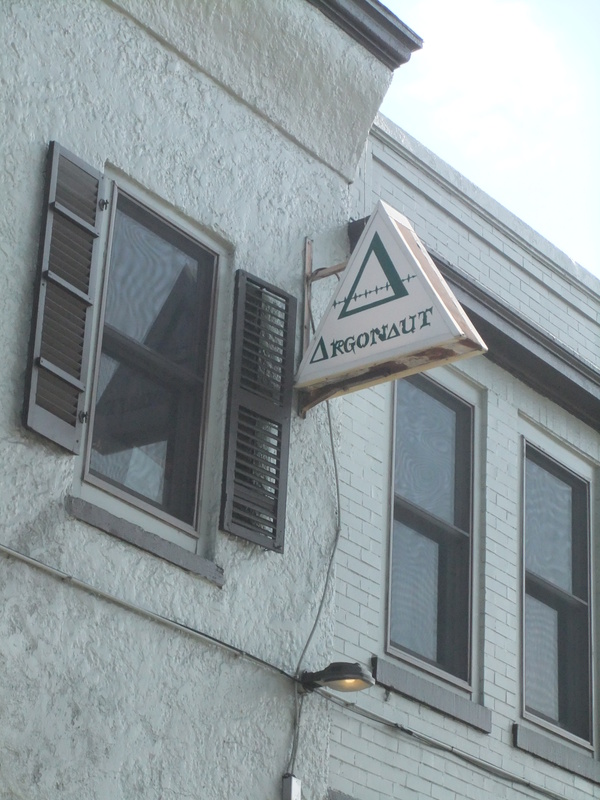 The Argonaut was a pleasant place to sit and relax on a weekend. Several large groups of young friends came in to have drinks and a meal together. Several other patrons came in to grab some food while enjoying the paper or working on a laptop. Overall a nice place for a weekend mimosa or Bloody Mary, but not the place to go if the food is your priority at brunch.